The Finsbury Park and Stroud Green Neighbourhood plan initiative was launched at our 2nd Regeneration Conference held in February 2015 at Rowan’s Leisure Centre. The Tri-Borough Councils initiated the Finsbury Park and Stroud Green Neighbourhood Area and Finsbury Park and Stroud Green Neighbourhood Forum in September 2018. The Forum is now able to produce a Neighbourhood Plan for their area. The FPSG plan is a legal planning document that is made up of planning policies for the usage and development of land in the local area, including planning application decisions. 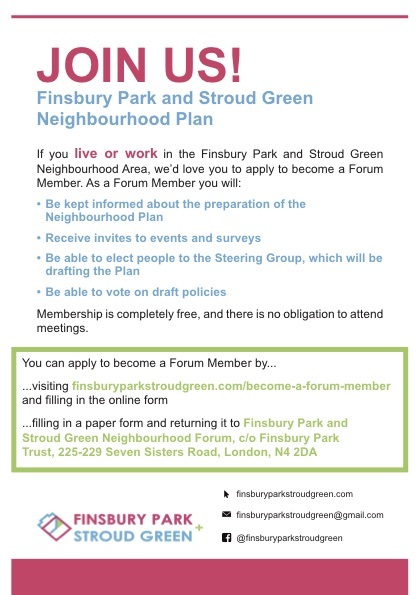 You can visit the Finsbury Park and Stroud Green Neighbourhood Forum website for more details about the Forum’s work and how you can get involved. 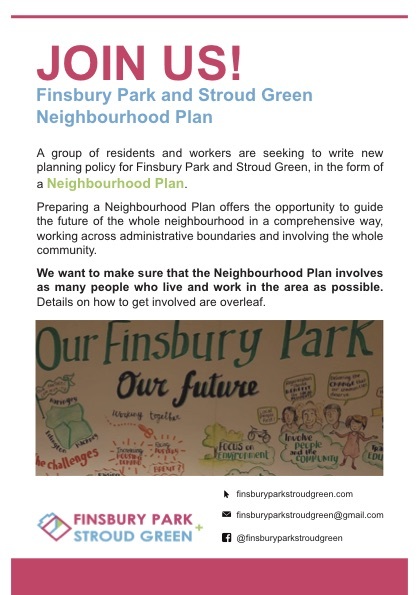 Click here to view information from Islington Council web the latest on local Neighbourhood Plan for Finsbury Park and also from the website of FPSG Neighbourhood plan. for more details..